QAM thanks Greg Ackman for this aircraft which was donated through the Australian Governments Cultural Gifts Program. Built by de Havilland Aircraft Co. Ltd. at Hatfield, Herts, UK. Built to RAF order as R5259 (c/n 83118), part of an order for 400 Tiger Moth II (R5236-R5265).The majority were shipped to Australia, New Zealand and Southern Rhodesia under the Empire Air Training Scheme. R5259 was shipped to Australia in the batch R5256-R5265 plus 31 other Tiger Moths from this order. Received by No. 1 Aircraft Depot, RAAF Laverton, Vic. Serviceable at No. 3 Elementary Flying Training School, Essendon, Vic. Allotted to 9EFTS, Cunderdin, WA ex 3EFTS. Allotted MacRobertson Miller Airlines at Maylands, WA ex 9EFTS for overhaul. Allotted to 9EFTS, Cunderdin ex MMA, Maylands. Allotted to Storage ex Strength 9EFTS. Allotted No. 86 Operational Base Unit, Cunderdin ex 9EFTS Storage Reserve. To be stored Category C.
Mathews advised DCA that he had purchased A17-321 and R5259 and that the pair would soon be ferried from Perth to Sydney. DCA allocated A17-321 as VH-AHR and R5259 as VH-AHS. Both aircraft were sold unconverted to R.S. Couper, Perth, WA. Robert Stephen Couper of Perth applied to register R5259. Overhaul for CofA begun at Maylands by Aero Service Pty. Ltd.
Added to Register as VH-BHK but a Certificate of Registration was not issued and the aircraft was struck off the Register. Test flown at Maylands by R.S. Couper after Certificate of Airworthiness overhaul. Added to the Register as VH-BKS and CofA issued same day. Change of ownership to Daniel S. Hunt, Perth, WA. Hunt was using VH-BKS and VH-BKN (ex A17-321) for fish-spotting along the coast in the vicinity of Albany and Esperance and also for occasional private flying. Hunt is the operator of Hunt's Canning Co. which also owns Esperance Canning Co. and King Sound Products. The company pilot is R.S. Couper. A fish survey flight from Albany by Couper was investigated by DCA due to the length of time over the water. VH-BKS was fitted with a long range fuel tank and radio for fish-spotting purposes. VH-BKS CofA lapsed and not renewed. VH-BKN will continue alone on spotting work. VH-BKS was struck off the Register. CofA renewal was begun at Maylands by Stan Doggett. Test flown at Maylands after overhaul. Returned to the Register as VH-BKS to Aero Spray Pty. Ltd., Perth. Aero Spray was a new company formed by Max Taylor who had been the first pilot for David Gray & Co. when they entered the aerial agriculture field in WA in 1951. Test flown at Maylands with new crop-spraying equipment fitted. Subsequently trials were conducted by Max Taylor at Caversham Airfield 6 miles north of Maylands. CofA was renewed. The aircraft flew the 1952 agricultural season flown by Max Taylor. The CofA expired and was not renewed. Taylor sold VH-BKS with expired CofA to Edwin John & Winnie Elizabeth Fry, trading as WA Produce Co., Perth. The sale was not finalised due to a financial dispute between the Frys and Taylor. Change of ownership to David Gray & Co. Ltd., Perth. Overhauled by Aero Service Pty. Ltd. at Maylands for CofA renewal. Aircraft in crop-praying configuration. Test flown at Maylands by Jim Pekin and returned to Register same day. Annual CofA renewal at Maylands. Test flown by A. Egerton-Green. Annual CofA renewal at Maylands. Test flown by R. Currell. During annual CofA overhaul at Maylands, the aircraft was resprayed silver overall. During annual CofA overhaul the aircraft was painted with a red fuselage and yellow wings. Hit power lines and suffered minor damage while landing near Yerecoin. 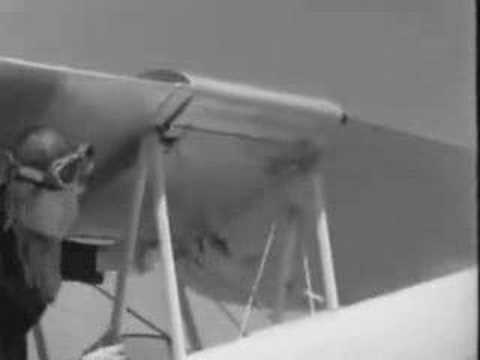 Pilot Digby Bull. While taking off from the same paddock on a test flight after field repairs, Bull struck the same power line, again causing minor damage. Change of ownership to Wilhelmus Michels, Perenjori, WA. Michels operated the store in the main street of Perenjori. He had entered into a business partnership with Max Taylor who would operate VH-BKS on crop-spraying in the Mingenew/Morawa district. Official date of change of ownership to Michels. VH-BKS was involved in an unspecified air safety incident on a flight from Maylands to Three Springs. Badly damaged on the farm of Edgar Gooch, "Bunderrie" at Three Springs. Taylor had been spraying on this property two months earlier and had left VH-BKS tied down near the farm house. During the night in late February, a storm blew the aircraft from its moorings and left it upside down against a nearby machinery shed. The aircraft was very badly damaged. Gooch had not seen Taylor since he parked the aircraft. Michels had the wreckage trucked from Three Springs to Perenjori where it was put up for sale. Its condition was said to be fair except for wing damage. The remains of VH-BKS were sold "as is" to P.J. Cull & B. Cochrain of Perth, who, in partnership with one other person, intended to rebuild the aircraft. The third member of the partnership owned a garage at Ballidu where the aircraft was taken for rebuilding. The wreckage had been purchased from Michels for 150 and it had suffered further minor damage when trucked from Perenjori to Ballidu. An attempt to purchase wings from Bob Couper & Co. at Cunderdin brought the rebuild to the attention of DCA. Because a restoration to full DCA airworthiness standards was now required, and given that this was not the original intention of the owners, the project was abandoned because of the additional cost. Subsequently, Messrs Cochrain and Cull trucked the aircraft from Ballidu to Perth where it was initially stored at Cull's home at 28 Riley Road, Tuart Hill. Later, the fuselage and some parts were moved to Cochrain's house at 145 Duke Street, Scarborough. The Gipsy Major engine, two props and cowlings were left at Cull's house. The fuselage of VH-BKS was inspected at Scarborough by AFA-AHG members and found to be in the open and in a badly deteriorated condition. The fuselage was inspected in detail by AFA-AHG members. All remains of VH-BKS were purchased from Mr Cull by Geoff Goodall of Perth and donated to the RAAF Association Museum. The fuselage was moved from Duke Street to 98 Westview Street, Scarborough for storage. Geoff Goodall visited Adelaide to discuss the restoration of VH-BKS with Mr John Boden of 14 Hooper Street, Salisbury, SA. Mr Boden had been rebuilding Tiger Moth A17-255 for some years and had built up a large spares collection. Mr Boden agreed to commence rebuild work on VH-BKS. The fuselage was moved from Scarborough to RAAF Base Pearce, WA. Flown from Pearce to RAAF Base Edinburgh by RAAF C-130 courtesy of the CO RAAF Pearce. The fuselage was moved by trailer from RAAF Base Edinburgh to John Boden's residence where a slow rebuild was commenced. 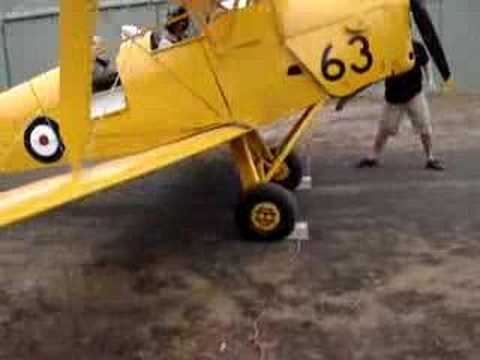 Subsequently, other Tiger Moth parts were sent to John Boden to assist in the rebuild. These included the rudder from VH-TSG. The fuselage was moved from John Boden's residence to RAAF Base Edinburgh. The fuselage was flown in RAAF C-130E A97-167 from Edinburgh to RAAF Base Richmond, NSW where it was transferred to another C-130. The fuselage was flown from Richmond to Pearce by RAAF C-130. Collected at Pearce by AFA members and taken to Bateman for storage. The history to this point was compiled by Geoff Goodall from official sources. The aircraft underwent further refurbishment at the RAAF Association Museum at Bull Creek. Purchased from Aviation Heritage Museum, WA by Greg Ackman. Loaned to QAM by Greg Ackman. Two QAM members departed Brisbane for Perth to pack the aircraft into a container for transportation to Caloundra. QAM recovery crew returned to Brisbane. The aircraft to follow by road. The aircraft arrived at Caloundra and reassembly began immediately. The cost of transportation from Perth to Caloundra was donated by QAM member, Les Boughen. QAM has given a commitment to conserve the aeroplane in its agricultural configuration. Formally donated to QAM by Greg Ackman. This aeroplane represents every museum's dream - an aeroplane which once belonged to an aviation historian! QAM thanks Geoff Goodall for saving the aeroplane in the first instance and for documenting its history so thoroughly. Corrected the date of purchase by Greg Ackman and added the date of formal donation to QAM. Added an image of the aircraft on display at Bull Creek. Thanks to David Eyre. Added an image of the reassembled aircraft at Caloundra thanks to Nick Sayer. Also recorded the fact that Les Boughen sponsored the transportation from Perth. Added arrival date at Caloundra. Added details and images of the refurbishment in 1987/88.